This was not first time the Navy had turned to film to tell its story. Early on, the Navy had collaborated with the Biograph Company on a now-lost series of 60 short films showing sailors and officers at work. The series screened at the 1904 St. Louis World’s Fair and 1905 Lewis and Clark Centennial Exposition in Portland before being put to use in a Midwest recruitment tour. Naval facilities and ships also figured prominently in early newsreels and narratives. The service took care to ensure that depictions presented it in a favorable light and reserved the right, for commercial films shot with official approval, to reuse them for the Navy’s own purposes. Buckey identified the fragment through careful detective work involving the ships and ordnance on display in the fragment. For example, the “E-2” class submarine, pictured in the opening scene, was taken out of service in 1915, and the shells mentioned in a intertitle—“It costs the U.S. government $970.00 for each 14 inch projectile fired”—were added to the naval arsenal the year earlier. 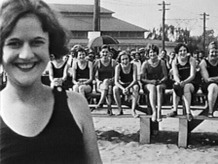 The clincher was matching a frame from the documentary with an image used in a newspaper piece to illustrate the Howe film. Buckey reported his research at the 2010 Orphan Film Symposium at New York University. Born in Wilkes-Barre, Pennsylvania in 1856, Lyman Hakes Howe got his start as a traveling salesman. In the 1880s he switched to lecturing and demonstrated a miniature working coal mine on the road. When movies came along, he was among the first to make the transition. He devised his own projector, the Animotiscope, which upgraded the Edison machine by adding a second reel, and playing a phonograph to add sound. Soon he was making his own travelogues and newsreels. Little survives of his output other than this fragment. The National Film and Sound Archive of Australia generously lent the nitrate print to make the preservation copies. Edge codes on the source material date from 1917, suggesting this print of an earlier film may have been distributed to demonstrate American naval strength after the United States entered World War I. New prints are available at the Library of Congress and the NFSA.